To Cite: Jansen P, Kaltner S, Prantl L, A. Kuehlmann B. Object-Based and Egocentric Mental Rotation Performance in Women With Breast Cancer, Women Health Bull. 2018 ; 5(2):e58268. doi: 10.5812/whb.58268. Background: Several studies have shown cognitive impairment occurring in patients after treatment of breast cancer. In this study, we investigated the mental rotation ability of patients with breast cancer (13 women) and 13 healthy control subjects. Methods: Participants solved a chronometric mental rotation test with object-based and egocentric transformations between May and June 2016 in a laboratory at the Center for Plastic, Aesthetic, Hand, and Reconstructive Surgery. Two repeated measure analyses of variance were performed with “stimulus condition”, “group”, and “angular disparity” as independent variables and “reaction time” (RT) and “accuracy rate” as dependent measurements. Furthermore, depression score, physical self-appearance, and cognitive speed were measured. Three separate univariate analyses of variance (significance level alpha = 0.05) were performed with those three measurements as dependent variables and the factor “group”. Results: The findings showed that women with breast cancer differed in their reaction time from subjects in the healthy control group: Women with breast cancer experienced fewer difficulties in solving the egocentric (1813.96 ± 1257.43) compared to the object-based transformations (2236.05 ± 1613.71, P = 0.043). There was no significant difference between the object-based transformation (1706.08 ± 473.11) and egocentric condition (2027.76 ± 932.66) in healthy women (P = 0.218). Conclusion: The results give a hint that relation to egocentric transformations increases in women with breast cancer compared to healthy women. Breast cancer is the most frequent cancer in women. In the US, there was an incidence of 232,000 new cases in 2013 (1). Breast cancer and its therapy are accompanied by various problems such as cognitive deficits (2), which are not well investigated so far regarding, for example, visual-spatial performance, which is related to body image (3). Moreover, body image is also important for women with breast cancer, but evidence is still scarce (4). Thus, in the present paper, we investigated the effects of breast cancer on visual spatial performance as well as on physical self-concept. Body image is a factor which is consistently important in women of early stage of breast cancer (5). The perception of body image depends on the kind of treatment received. Patients receiving breast-conserving surgery had a better body image than patients with mastectomy or mastectomy with breast reconstruction (6). Furthermore, it has been shown that subjective cognitive impairment is frequent in breast cancer patients for several years following treatment (2, 7). Some neuropsychological studies show that the possible influence of chemotherapy on cognitive function is inconsistent (7, 8). Quite recently, Lee, Tierney, Wu, Prutchard, and Rochon (8) indicated a relation between endocrine therapy and decreased performance on neuropsychological cognitive testing. Only one study has investigated visual spatial processing in women who suffer from breast cancer undergoing adjuvant endocrine therapy (9). Their results did not find any differences in one form of visual processing, mental rotation ability, between breast cancer patients undergoing different treatments. Mental rotation is a process occurring when people imagine a representation of a rotated object in mind (10). There are object-based transformations, in which the observer has a fixed position and rotates the object in relation to its surroundings (11). In egocentric transformations, the participant has to assume the perspective of the object and imagine rotating one’s own body. Egocentric transformations are more embodied and thus, proprioceptive information is more important (12). In an object-based mental rotation task measuring reaction time (cMRT), two non-mirrored or mirrored items, where the right item is a rotated version of the left one, are presented simultaneously on a screen. Participants have the task to decide whether both items are non-mirrored or mirror reversed. In an egocentric mental rotation task, there is the presentation of one figure type raising one arm. Here the participants have to decide which arm was raised and complete a left-right decision task (12, 13). In this case, participants must imagine themselves in the position of the presented figure. There is a lot of experimental evidence suggesting that both kinds of transformation differ from each other (14). Results have shown that embodied stimuli are easier to process than three dimensional cube figures (15) and the weight of the person might play an important role (16). Another factor, which influences mental rotation performance, is perceived body composition in the sense of body awareness. Two studies have previously shown that overweight children exhibit impaired mental rotation performance compared to normal-weight children (16, 17). Also, patients with anorexia nervosa showed a better mental rotation performance than healthy controls (18). All three studies lead to the assumption that the perception of this body composition affects mental rotation performance. Patients with breast cancer also have a higher awareness of their body (5). 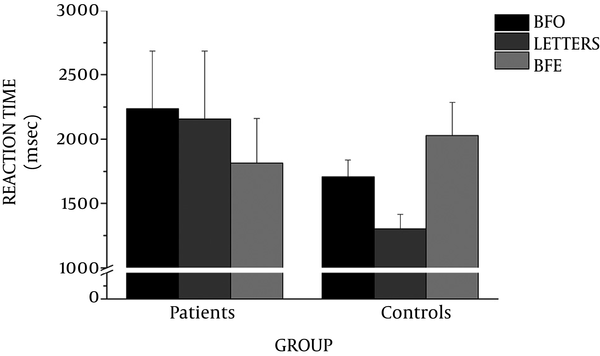 Due to this fact and based on the association between body awareness and mental rotation, we assume that this group of patients differ in their mental rotation performance from the healthy control group. Because women with breast cancer show a cognitive decline, we assume that they show an impaired mental rotation performance especially in more difficult tasks in comparison with healthy women resulting in an interaction effect of the factor “group” and “angular disparity” (16). Since people with breast cancer are highly interested in understanding their own body, the performance of these women with breast cancer should be better in the egocentric mental rotation condition than in the two object-based conditions. Especially for persons with breast cancer, the physical self-description should be related to their mental rotation performance. This could be expressed by a negative correlation between physical self-description and mental rotation performance in breast cancer patients. Twenty-six women (age range between 38 and 74 years) participated in the study between May and June 2016 in a silent laboratory at the Center for Plastic, Aesthetic, Hand, and Reconstructive Surgery. In the study with a clinical sample (16), the effect size of mental rotation differences between the clinic and healthy groups for the accuracy of the most difficult task was d = 1.2. This effect size could be detected with a level of α = 0.10 and a probability of 1 - β = 0.90 with a sample size of 26 participants, 13 in each group for the more difficult mental rotation tasks. There were 13 women who suffered from breast cancer (mean age: 53.46 ± 8.05) and 13 healthy women (mean age: 51.15 ± 8.75), who served as the control group, see Table 1. The healthy women were recruited through advertisements in local newspapers, the women with breast cancer in co-operation with a Centre for plastic, aesthetic, hand, & reconstructive surgery. All of the patients received a mastectomy with a DIEP-flap. From one patient we did not receive the relevant data concerning the kind of breast cancer and treatment. The mean time after surgery was 4.7 years. One patient suffered from a ductal carcinoma in situ, and all other carcinomas were malignant. Most (ten/twelve) of the carcinomas were hormone sensitive, and one patient suffered from a recrudescence from grain. Five of the patients received chemotherapy, two of them chemotherapy and radiation, one radiation, and one anti-hormone-therapy. The use of medicine was controlled. All patients and the healthy women gave informed consent for participation. The study was reviewed and approved by the institutional board of the University. The Breast-Q (augmentation module) is a specific instrument for the evaluation of a patient’s reported outcome among women undergoing different types of breast surgery. It measures patient’s satisfaction in six dimensions: in the areas of physical, psychosocial, and sexual wellbeing as well as satisfaction with breasts, overall outcome, and care with 88 items in total. Response scales were based on 3-, 4-, or 5- point Likert scales. There were only scores within each single category with values ranging from 0 to 100. Test-retest reliability gave r = 0.85 – 0.94; Cronbach's alpha values ranged from 0.81 to 0.94. The authors claim that construct validity was given by interscale comparisons and correlations with socio-demographic variables. Item total correlation varied between 0.55 and 0.78. This test comprises 70 items on the following 11 dimensions: strength, body fat, activity, endurance/fitness, sports competence, coordination, health, appearance, flexibility, global physical self-concept, and self-esteem. Response scale was based on a 6-point Likert scale. Cronbach's alpha values ranged from 0.67 to 0.92. Construct validity was given through a confirmatory factor analysis (comparative fit index = 0.95, χ2/df = 3.88). A screening of depression was conducted using the Center of Epidemiological studies depression scale (CES-D-Scale, long version; German version: ADS-L). This screening instrument measures the different stages of depressive symptoms, like uncertainty, fatigue, hopelessness, etc. The questionnaire with 20 sentences, which have to be judged, lasts around 10 minutes. Response scale was a 4-point Likert scale. Cronbach's alpha values ranged from 0.89 to 0.92, within depressive patients at 0.92. Validity is given by the correlation with other depression scales like the Beck depression inventory, which range from 0.72 to 0.94. Cognitive Speed was measured with the Number-connection test. This test consists of six sheets of paper: two of them were exercise sheets and four of them were test sheets. On each of the four test sheets, the numbers 1 to 90 are printed in scrambled order. The connection of numbers with a pen, as quickly as possible, was the task of the participants. The correctly solved ones were transformed into IQ values. The test lasts around 20 minutes. The test-retest reliability gave r = 0.95. The correlation between the ZVT and standard IQ tests is about r = 0.60 to 0.80. A laptop with a 17” monitor located approximately 60 cm in front of the participant was used for the mental rotation test (see (23)). There were different stimuli types, all rotated in the picture plane: a) front view of two pictures of a female person with either the left or the right arm extended (body figure object-based: BFO), b) front or back view of a picture of one female person with either the left or right arm extended (body figure egocentric: BFE), and c) the letters F and R (two letters each), see Figure 1. For the two object-based conditions, two drawings were presented simultaneously, (BFO and letters condition) in pairs and the angular disparity was 0°, 45°, 90°, 135°, or 180°. The right stimulus was obtained by rotating the left stimulus. Half of the trials use pairs of identical objects and the other half uses mirror-reversed images. Only one figure (with either lifting the left or right arm) was presented in the rotation angle 0°, 45°, 90°, 135° or 180° in the BFE condition. At the beginning of each individual test session (total time: 60 minutes), each woman completed the demographic questionnaire (5 minutes), the ADS-L-Scale (5 minutes), the PSDQ (5 minutes), and the ZVT (5 - 10 minutes). After a short break, the mental rotation test (40 minutes) was conducted with a standardized task instruction. In the BFO and letter conditions, participants had to decide as quickly and as accurately as possible if the stimuli were either the same (non-mirror reversed) or different (mirror-reversed). When the two stimuli were the “same,” (“different”) the participants must press the left (“right”) mouse button. In the BFE condition, participants had to press the left mouse button when the figure raised the left arm and the right mouse button in the case of the right arm. Each trial appeared as follows: After the presentation of a fixation cross for one minute, a pair of stimuli stayed on the screen until participants answered. Participants received feedback given for 500 ms. After 1500 ms, the next trial began. Separated blocks (80 trials each block with a pause of 15 s after ten trials and a break of one minute between blocks) were used for each type of stimuli. 6 practice trials were presented prior to each block. Both the order of the three blocks and the order of the stimuli within each block were randomized. This results in 240 trials: 3 stimulus conditions (BFE vs. BFO vs. letters) * 2 decision types (same vs. different or left vs. right) * 5 angular disparities (0°, 45°, 90°, 135°, or 180°) * 4 repetitions of each combination * 2 types of stimuli (BFO: letters; BFE), see Jansen and Kaltner (23). Three separate Univariate analyses of variance were performed with “PSDQ”, “ADS-L”, and “ZVT” as the dependent variables and “Group” served as the between-subject factor. Significance level was set to alpha = 0.05. For the mental rotation test, two repeated measure analyses of variance were performed with “stimulus condition”, “group”, and “angular disparity” as independent variables and “reaction time” (RT) and “accuracy rate” as dependent measurements. If sphericity of the data was violated, Greenhouse-Geiser correction was used. Because mental rotation performance relates to age, intelligence, weight (23), and depression (24), further correlation between mental rotation performance and those variables was conducted. Significance level was set to alpha = 0.05. The following means and standard deviations were calculated: Satisfaction with breasts (59 ± 14.17); satisfaction with outcome (64.16 ± 25.69); satisfaction with care (76.83 ± 16.65) and physical wellbeing (72.58 ± 10.18); psychosocial wellbeing (69 ± 28.5) and sexual wellbeing (43.00 ± 27.53). The univariate analysis of variance demonstrated no difference between both breast cancer and healthy control women in the physical self-description (P = .655). The univariate analysis of variance indicated a significant difference between the groups in the screening of depression (P = .020). Women with breast cancer showed a higher score than healthy controls; see Table 1. The univariate analysis of variance indicated that the performance between the groups did not differ in cognitive processing speed, (P = 0.123). The repeated measurements of analysis of variance showed a main effect on reaction time by factors “stimulus type”, (P = 0.028) and “angular disparity”, (P < 0.001), and a significant interaction between “stimulus type” and “group”, (P = 0.028), see Figure 2. The reaction time for angular disparities increases with increasing angular disparity significantly (one-tailed Bonferroni corrected t-test for the reaction time of two angular disparities which followed each other), but only for angular disparities between 90° and 135°, (P = 0.005) and 135° and 180°, (P < 0.001), see Table 2. The main effect of the factor “stimulus condition” on reaction time (ms) was qualified by an interaction with the factor group (see Table 3). To analyze this interaction further, we compared for each group the reaction time between the different stimuli conditions with dependent t-tests. For the group of women with breast cancer, there was no difference between the reaction time for the BFO (2236.05 ± 1613.71) and letter condition (2158.39 ± 1895.43), (P = .406), nor between BFE (1813.96 ± 1257.43) and letter condition (2158.39 ± 1895.43), (P = 0.304). However, a significant difference between the BFO (2236.05 ± 1613.71) and BFE (1813.96 ± 1257.43) condition could be demonstrated, (P = 0.043). Patients showed a higher reaction time in the BFO compared to the BFE condition. In the healthy control group, the reaction time was higher for the BFO condition (1706.08 ± 473.11) in comparison with the letter condition, (1301.29 ± 415.38), P = 0.003. They exhibited a higher reaction time in the BFE (2027.76 ± 932.66) compared to the letter condition (1301.29 ± 415.38, p = .003). There was no significant difference between the BFO (1706.08 ± 473.11) and BFE conditions (2027.76 ± 932.66, P = .218), see Figure 2. The repeated measurements of analysis of variance showed a main effect on mental rotation accuracy by the factor “angular disparity”, P < 0.001 and a significant interaction between the factors “group” and “stimulus condition”, (P = 0.041), see Table 4. One-tailed Bonferroni corrected t-test for the accuracy of two angular disparities which followed each other shows that only the difference between 135° and 180° reached significance, (P = 0.013), see Table 2. 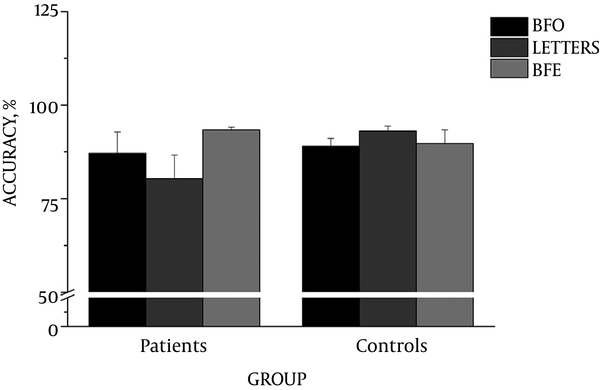 Analyzing the interaction for each group separately revealed that there was only a significant difference for the patients between letters (80.4%, ± 22.7) and the BFE (93.4% ± 2.7) conditions, P = 0.05, see Figure 3. The mean reaction time was not correlated with the mean accuracy rate (r = -0.231, P = 0.257); also no correlation between reaction time and accuracy rate within each stimulus condition and within each group was calculated. A possible speed accuracy trade off cannot be assumed. Computing the Spearman correlation between age, body-mass-index, depression, the results of physical self-questionnaire, cognitive processing speed, and mental rotation performance revealed significant correlations only between reaction time and a) cognitive processing speed (r = -0.580, P = .002) and b) physical self-appearance (r = -0.513, P = 0.007), as well as between accuracy and cognitive processing speed (r = 0.692, P < 0.001). Analyzing this correlation separately for each group showed that only the correlation of accuracy with cognitive processing speed for women with breast cancer was significant, (r = 0.589, P = 0.034). The results reveal that in women with breast cancer, object-based stimuli were processed more slowly than egocentric embodied stimuli. The result is partly in line with our first hypothesis with the limitation that no reaction time difference could be ruled out between the BFE and letter conditions. Thus, our first hypothesis indicating that there is a difference in mental rotation performance between persons with breast cancer and healthy women especially for the difficult tasks could not be confirmed. The confirmation of the assumption depends on the kind of stimulus. One interesting result is the enhanced mental rotation performance in women with breast cancer using egocentric stimuli compared to object-based ones. Egocentric transformations rely on simulated bodily movements (25) and are embodied to a greater extent than object-based ones (26). The results give a hint that relation to egocentric transformations increases in women with breast cancer compared to healthy women. Another explanation might derive from one further finding of the present study that higher values in self-description related to a shorter reaction time in mental rotation. This result, which is independent of the type of stimulus, is in accordance with our third formulated hypothesis. Furthermore, depression scores, which differed between the two groups, did not relate to mental rotation performance. The performance of healthy control women might be comparable to the data and results of a study with healthy people of all age groups (23). Comparing the reaction time of older people in the study of (23) with the results obtained here reveals similar reaction time patterns across both studies. One of the advantages of our study is the detailed investigation of mental rotation performance depending on different stimulus types in patients with breast cancer compared to a healthy control group. We did not find any difference between the groups in cognitive speed, which in turn correlated with intelligence. Furthermore, our results showed that there is a relationship between mental rotation performance and physical self-description in patients with breast cancer. This suggests that body-based processes play an important role in the visual-spatial imagery in patients with breast cancer. Despite these advantages, several limitations existed in this study, such as the small number of participants. Consequently, a differentiation between patients receiving chemotherapy or endocrine therapy or both was not possible. This distinction should be included in future studies. This study can be considered as a pilot study in this area due to the limited number of participants and the inability to differentiate between the types of received therapy, the kind of cancer, the date of surgery, etc. A relationship between physical awareness and mental rotation could be identified. Mental rotation is helpful in completing everyday tasks, such as way-finding (27). Therefore, this topic deserves more attention in future studies. Authors’ Contribution: PJ, SK, LP, BK Study concept and design, SK, BK Acquisition of data, PJ, SK Analysis and interpretation of data, PJ Drafting of the manuscript and Statistical analysis, PJ, SK, LP, BK Critical revision of the manuscript for important intellectual content, SK Administrative, technical, and material support, LP Study supervision. Confirmation: The study presents original, unpublished work and is not under consideration for publication elsewhere. 1. DeSantis C, Ma J, Bryan L, Jemal A. Breast cancer statistics, 2013. CA Cancer J Clin. 2014;64(1):52-62. doi: 10.3322/caac.21203. [PubMed: 24114568]. 2. Pullens MJ, De Vries J, Roukema JA. Subjective cognitive dysfunction in breast cancer patients: a systematic review. Psychooncology. 2010;19(11):1127-38. doi: 10.1002/pon.1673. [PubMed: 20020424]. 3. Darling S, Uytman C, Allen RJ, Havelka J, Pearson DG. Body image, visual working memory and visual mental imagery. PeerJ. 2015;3. e775. doi: 10.7717/peerj.775. [PubMed: 25737815]. 4. McClelland SI, Holland KJ, Griggs JJ. Quality of life and metastatic breast cancer: the role of body image, disease site, and time since diagnosis. Qual Life Res. 2015;24(12):2939-43. doi: 10.1007/s11136-015-1034-3. [PubMed: 26038224]. 5. Rosenberg SM, Tamimi RM, Gelber S, Ruddy KJ, Kereakoglow S, Borges VF, et al. Body image in recently diagnosed young women with early breast cancer. Psychooncology. 2013;22(8):1849-55. doi: 10.1002/pon.3221. [PubMed: 23132765]. 6. Spatuzzi R, Vespa A, Lorenzi P, Miccinesi G, Ricciuti M, Cifarelli W, et al. Evaluation of Social Support, Quality of Life, and Body Image in Women with Breast Cancer. Breast Care (Basel). 2016;11(1):28-32. doi: 10.1159/000443493. [PubMed: 27051393]. 7. Mehlsen M, Pedersen AD, Jensen AB, Zachariae R. No indications of cognitive side-effects in a prospective study of breast cancer patients receiving adjuvant chemotherapy. Psychooncology. 2009;18(3):248-57. doi: 10.1002/pon.1398. [PubMed: 18756583]. 8. Lee PE, Tierney MC, Wu W, Pritchard KI, Rochon PA. Endocrine treatment-associated cognitive impairment in breast cancer survivors: evidence from published studies. Breast Cancer Res Treat. 2016;158(3):407-20. doi: 10.1007/s10549-016-3906-9. [PubMed: 27432418]. 9. Berndt U, Leplow B, Schoenfeld R, Lantzsch T, Grosse R, Thomssen C. Memory and Spatial Cognition in Breast Cancer Patients Undergoing Adjuvant Endocrine Therapy. Breast Care (Basel). 2016;11(4):240-6. doi: 10.1159/000446901. [PubMed: 27721710]. 10. Shepard RN, Metzler J. Mental rotation of three-dimensional objects. Science. 1971;171(3972):701-3. [PubMed: 5540314]. 11. Kosslyn SM, DiGirolamo GJ, Thompson WL, Alpert NM. Mental rotation of objects versus hands: neural mechanisms revealed by positron emission tomography. Psychophysiology. 1998;35(2):151-61. [PubMed: 9529941]. 12. Kaltner S, Riecke BE, Jansen P. Embodied mental rotation: a special link between egocentric transformation and the bodily self. Front Psychol. 2014;5:505. doi: 10.3389/fpsyg.2014.00505. [PubMed: 24917832]. 13. Steggemann Y, Engbert K, Weigelt M. Selective effects of motor expertise in mental body rotation tasks: comparing object-based and perspective transformations. Brain Cogn. 2011;76(1):97-105. doi: 10.1016/j.bandc.2011.02.013. [PubMed: 21429647]. 14. Voyer D, Jansen P, Kaltner S. Mental rotation with egocentric and object-based transformations. Quarter J Experiment Psychol. 2016;2006(11):2319–30. 15. Amorim MA, Isableu B, Jarraya M. Embodied spatial transformations: "body analogy" for the mental rotation of objects. J Exp Psychol Gen. 2006;135(3):327-47. doi: 10.1037/0096-3445.135.3.327. [PubMed: 16846268]. 16. Jansen P, Schmelter A, Kasten L, Heil M. Impaired mental rotation performance in overweight children. Appetite. 2011;56(3):766-9. doi: 10.1016/j.appet.2011.02.021. [PubMed: 21419816]. 17. Pierce JW, Wardle J. Cause and effect beliefs and self-esteem of overweight children. J Child Psychol Psychiatry. 1997;38(6):645-50. [PubMed: 9315974]. 18. Kaltner S, Jansen P. Does Body Awareness Influence Visual Spatial Intelligence?. Int J Learn Teach Educat Res. 2015;(4). 19. Pusic AL, Klassen AF, Scott AM, Klok JA, Cordeiro PG, Cano SJ. Development of a new patient-reported outcome measure for breast surgery: the BREAST-Q. Plast Reconstr Surg. 2009;124(2):345-53. doi: 10.1097/PRS.0b013e3181aee807. [PubMed: 19644246]. 20. Marsh HW, Richards GE, Johnson S, Roche L, Tremayne P. Physical Self-Description Questionnaire: Psychometric properties and a miiltitrait-meltimethod analysis of relations to existing instruments. J Sport Exercis Psychol. 1994;16(3):270-305. 21. Hautzinger M, Bailer M, Hofmeister D, Keller F. Allgemeine depressionsskala (ADS). Psychiat Prax. 2012;(6):302–4. 22. Oswald WD, Roth E. Der Zahlen-Verbindungs-Test: ZVT; ein sprachfreier Intelligenz-Schnell-Test [zur Messung der" kognitiven Leistungsgeschwindigkeit"]; Handanweisung. Hogrefe; 1978. 23. Jansen P, Kaltner S. Object-based and egocentric mental rotation performance in older adults: the importance of gender differences and motor ability. Neuropsychol Dev Cogn B Aging Neuropsychol Cogn. 2014;21(3):296-316. doi: 10.1080/13825585.2013.805725. [PubMed: 23822582]. 24. Rogers MA, Bradshaw JL, Phillips JG, Chiu E, Mileshkin C, Vaddadi K. Mental rotation in unipolar major depression. J Clin Exp Neuropsychol. 2002;24(1):101-6. doi: 10.1076/jcen.24.1.101.974. [PubMed: 11935428]. 25. Zacks JM, Michelon P. Transformations of visuospatial images. Behav Cogn Neurosci Rev. 2005;4(2):96-118. doi: 10.1177/1534582305281085. [PubMed: 16251727]. 26. Kessler K, Thomson LA. The embodied nature of spatial perspective taking: embodied transformation versus sensorimotor interference. Cognition. 2010;114(1):72-88. doi: 10.1016/j.cognition.2009.08.015. [PubMed: 19782971]. 27. Pazzaglia F, Moe A. Cognitive styles and mental rotation ability in map learning. Cogn Process. 2013;14(4):391-9. doi: 10.1007/s10339-013-0572-2. [PubMed: 23771207].